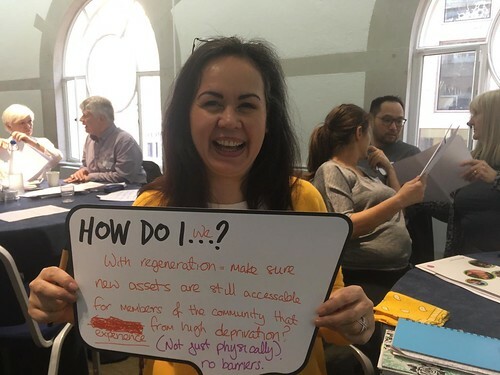 When we first embarked upon Big Local in Westfield, we were asked what we would like to achieve. All of us involved had differing aspirations, hopes and desires. I’m sure we were not alone in letting our imaginations run riot! 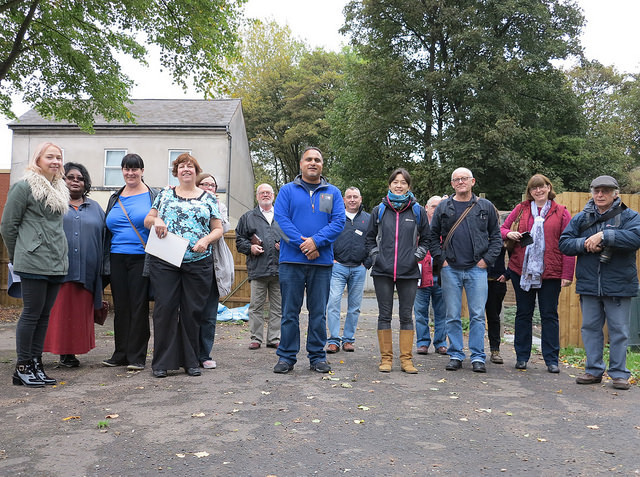 Eventually we came to a collective decision and agreed our main priorities, which included spaces for socialising, health and well-being, education and employment and activities for all the community, young and old. 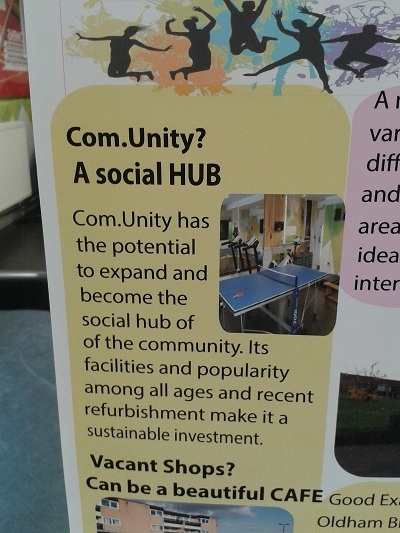 So we decided we wanted to negotiate with Sheffield City Council to complete the asset transfer of Com.unity (our local community centre), which was in danger of being closed down due to lack of funding. As a base for Westfield Big Local and a hub for the whole community, Com.unity linked to all of our priorities: it is a safe, social place where local people can come to play, work and train. We were a group of enthusiastic amateurs seeking to improve the lot of the residents of Westfield; and sat on the other side of the table was a team of experienced local government officers. We felt that they might be looking to offload the asset as soon as possible, with as little fuss as necessary. I knew we needed to be well prepared if we were going to get the best outcome for our community. 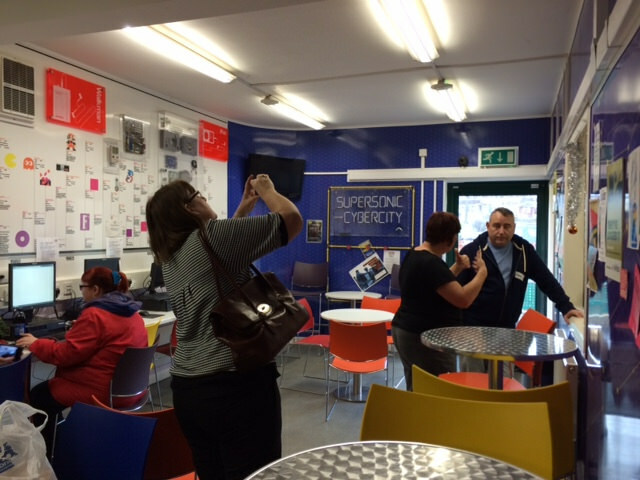 We gathered lots of information from our visits to other community projects, hosted by colleagues who were like us part of the Big Local shops, hubs and empty buildings networking group (pictured below). This gave us considerable confidence to approach our objective of acquiring the lease of Com.unity. The first set back came as a shock as we were informed that our existing locally trusted organisation did not have in their constitution the authority to employ or pay the staff we would need to run Com.unity. Regrettably, we had to search for another locally trusted organisation. Thankfully we were successful in a relatively short period of time and appointed our current LTO who are doing sterling work on our behalf. After the first meeting with the council, and acting on the advice gleaned from one of our meetings with the shops, hubs and empty buildings group, we enlisted the services of a social investment rep, Tim Morton, provided by Local Trust, who was absolutely invaluable for his help and advice. We were advised to apply for a pro bono solicitor who again proved to be invaluable. It is amazing to reflect how much professional help, expertise and advice is out there for free! Tim also suggested the services of a pro bono surveyor to produce a report on the state of the building. By the time we met again with the council, we felt very well prepared. We were able to be hard-nosed negotiators, and as a consequence, re-negotiated the lease to suit our needs and purposes. For example, we negotiated to be able to choose qualified local people for maintenance of the building, rather than taking over the council’s arrangement with a large company. We have achieved our objective! We are elated to say the least. As we sit here today, just 15 months down the line, our pro bono solicitor and the solicitor from Sheffield City Council are in the process of drawing up the formal document for signature- a massive achievement for this community. Had we not successfully negotiated the asset transfer of the building, our estate would have no meeting place, no community centre, therefore no youth club and as a consequence the heart of this community would have been torn out. Now we can look forward to organising and arranging countless activities to suit all age groups and help revitalise this community. We at Westfield Big Local are indebted to so many people for their services and advice, too many to mention but all of them have, in some way or another, had links to Big Local. It must be recognised that our participation in the shops, hubs and empty buildings group has opened doors and introduced us to situations, people and a wealth of help and advice that has made our journey so much easier and enjoyable.